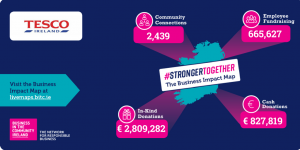 We have the highest level of community connections at 2439 thanks to partnerships we build through the Tesco Community Fund and our surplus food donations programme, almost 3 times as many as closest company Bank of Ireland. We have the highest level of in-kind donations at €2.8million, driven through our surplus food donations programme. At €665,627 raised last year, we’re second only to Bank of Ireland who use bureau de change coins for their main fundraising drives. Thank you to all of our colleagues who are at the heart of our community agenda and are the driving force behind these fantastic figures! Make sure to check out the Business Impact Map for your local area!